Using aggregated income tax data from the IRS for 2012, I calculated some statistics about zipcodes in Washington State and nationally. As you can see from the first chart near the end of this article, the average income in Medina, WA (home of the world’s richest man, Bill Gates) is $625,056. That’s over twice the average of Mercer Island, WA (the runner-up in highest income, $279,055). But Medina residents on average pay a lower percentage (20.9%) of their income in federal taxes than residents of Mercer Island (21.9%). The top 0.1% really have it good. Furthermore, Medina residents earn over 11 times the income of Renton zipcode 98057 (rank 145 in income in WA, with average income $54,575). But residents of zipcode 98057 pay an average of 14.6% of their taxes in income — not far below Medina’s 20.9%. The low federal tax rate of the richest zipcodes holds nationwide too. See the second chart below. Miami Beach has the highest average income, $2,694,776, of all US zipcodes. Its average income tax rate is 18.1%, a lower rate than 726 zipcodes, including 67009 (Attica, KS), where the average income is $52,183 and the tax rate is 19.2%. Moreover, state and local taxes are even more regressive than federal taxes. Washington State is the most regressive, followed by Florida, South Dakota, Illinois, Texas, Tennessee, Arizona, Pennsylvania, Indiana, and Alabama. In these “Terrible Ten” states, the bottom 20 percent pay up to six times as much of their income in taxes as their wealthy counterparts. 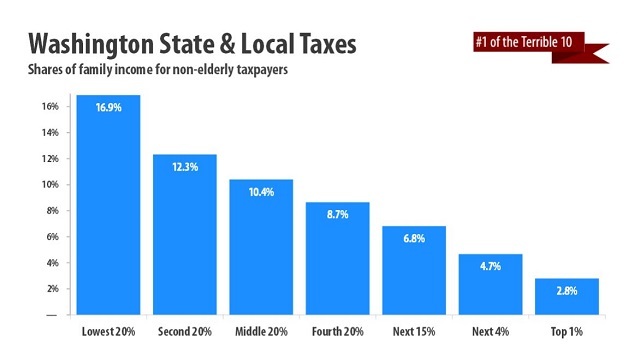 The graph below from ITEP shows that the richest 1% of Washingtonians pay only about 2.8% of their income in state taxes, while the poorest 20% pay about 16.9%. In short, Washington State’s tax system is insane. State and local taxation is broken in all states. “The average overall effective state and local tax rates by income group nationwide are 11.1 percent for the bottom 20 percent, 9.4 percent for the middle 20 percent and 5.6 percent for the top 1 percent” (source). For other articles about income inequality and unfair taxation, see Microsoft’s tax avoidance schemes: national and in Washington State and the many links on the left of this website (http://waliberals.org). Note: the numbers in the chart above are subject to the limitations of the data described at the IRS. Hey, Washingtonians! Do you like giving away your money?